beautiful bag! and those pants are just divine! OMG OMG OMG - love it all!!!!!!! What FUN pants!! Love them! def. loving the print of those pants. i was wearing a tropical print yesterday myself. Also that bag is rocking! Those trousers are fantastic! And the bow detail is super cute. Love your nails and the cuff! I love Rebecca Minkoff bags! 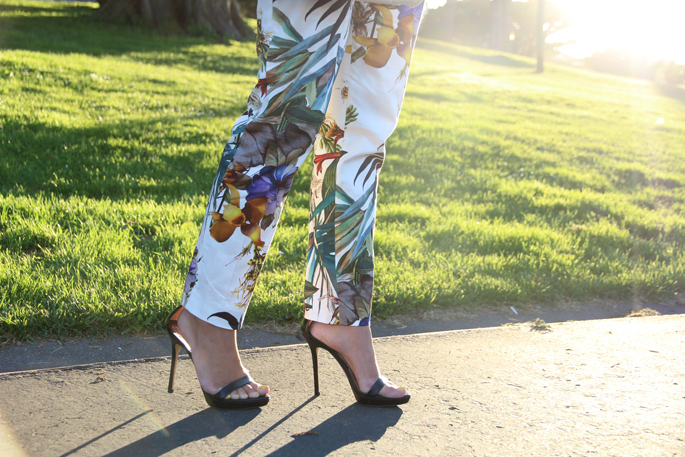 no one wears floral pants quite as well as you! wishing i would have splurged on these instead of the h&m ones i bought. these are just gorgeous! You're making me want to go to the islands with those pants on! So cute, girl! 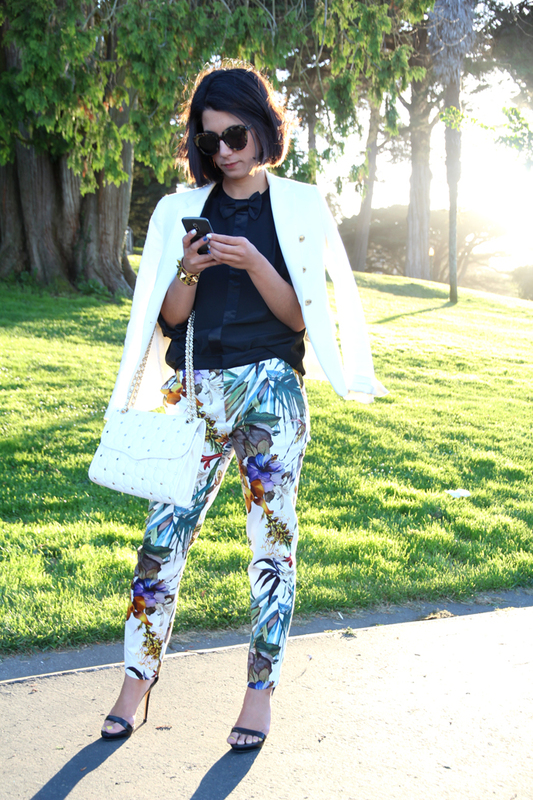 Love the tropical pant and your bag!! Love those printed pants! They look amazing. Love the monochrome styling paired with these trousers...killer outfit! Amazing pants and bag!!!!! Love it! So pretty and so elegant ! I am loving it ! I love the bow tie detail on the top! So cute! I love the printed trousers! Gorgeous shots! Love the light coming from behind! That bag is so fab! Love the bag and the pants!! They are gorgeous!! That bag has been on my wishlist for quite some time - I love it. Great look, Krystal! I enjoyed browsing in your blog. I'm following you hoping to stay connected. love your pant and bag so much! love these pants!!!!!!! great look! love those pants! they look great on you! Love, love, love your trousers ! OMG! lOVE all this look! Su. these pants are fabulous! i am living in my windy patterned pants as well, they're the best in this heat! love your pants and shoes! Really really love the pants and bag!! Gorgeous! I love those pants. So pretty! I can't believe I just found your blog- love your style!